As a relatively new writer, I often wonder if I’m doing things right. A friend of mine told me “If you’re writing, then you’re doing it right.” Fair enough. The most common advice authors tend to give out is to read voraciously and write often. However, there are still things we should know as writers. Larry Brooks’ 5 Creative Flaws That Will Expose Your Lack of Storytelling Experience – Great post explaining small changes that have a large impact. Very clear and concise. MaryElizabeth Summer’s 7 Things Your English Teacher Lied to You About – As a one time English teacher, this post had me giggling to myself. Yep, I remember telling kids all of these rules. While they probably still apply in some areas, they really don’t necessarily apply to your novel/writing. Kara Lennox’s How Much Research is Enough? – This is a great question. As authors should we be more concerned with enteraining or knowing the ins and outs of every skill/job/experiment/task/etc our characters perform? Chuck Wendig’s 25 Ways to Defeat the Dreaded Writers’ Block – We all face it at one time or another! Check out his book, 250 Things About Writing too. Marcy Kennedy’s Crafting a 25-Word Pitch – Great information for your pitch. Struggling with your novel? Take time to write your pitch and maybe you’ll see where the problem is! I know there are many other useful links out there as well. Please share some of your favorites in the comments section! This entry was posted in Uncategorized and tagged Chuck Wendig, Kara Lennox, Larry Brooks, Links, Marcy Kennedy, ME Summer, Writing on July 25, 2011 by Tammy. Tomorrow is my official weigh in day where I’ll post my numbers as well as progress photos but I was feeling good today and decided I should take a picture of me in my everyday clothes each month as well. Uncharacteristically, I woke up in a good mood today. Of course, I was tired but not as grouchy as I normally am. Mike knows to just let me do my thing in the mornings and tries to stay out of my way the best he can! I just feel like today is going to be full of blessings…and I hope I’m not wrong. We’ll find out in a few hours, won’t we?! I really like this shirt too. It’s several years old but not well worn. It’s made out of some sort of fabric that shows my belly bulges a little too clearly for me at times! Since I’m down to the smallest I’ve been in a couple of years (not sure how many exactly) I finally feel confident to wear it more often. Of course, belly still makes its appearance when I sit down…but whose doesn’t?! Mike took this picture for me at work. Then he told me to spin…so I did. This was the outcome. I normally would have deleted this photo but I decided what the hell! Have a great Thursday everyone! 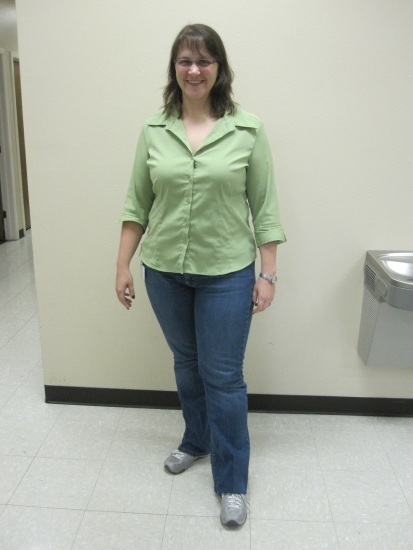 This entry was posted in Progress, Uncategorized and tagged Progress on March 24, 2011 by Tammy. Today’s walk/run went well. It was 59 degrees outside, which is just about perfect in my opinion. I went to Tamarac Park, which is one of my favorite places to exercise since the loop is 5K and it’s not very crowded. I ended up going almost 3.4 miles in about 55. I alternated walking for 4 minutes and running for 1. I was trying my best to do Pose running…but could tell when I was getting out form. It seems that I go faster using that form that normal…which makes sense since I’m not putting the breaks on by heel striking. This morning I tried to go by Luke’s Locker to look for some low profile shoes for CrossFit but they weren’t open. The only note on the door said “We will be closing at 3 today. Happy New Year!”. Would have been nice to have another that said “Closed New Year’s Day”. So, I went to Borders to pick up a book. They had The Paleo Diet for Athletes. I don’t consider myself an athlete, but this book is supposed to be the best for people doing Paleo while training for endurance performance. 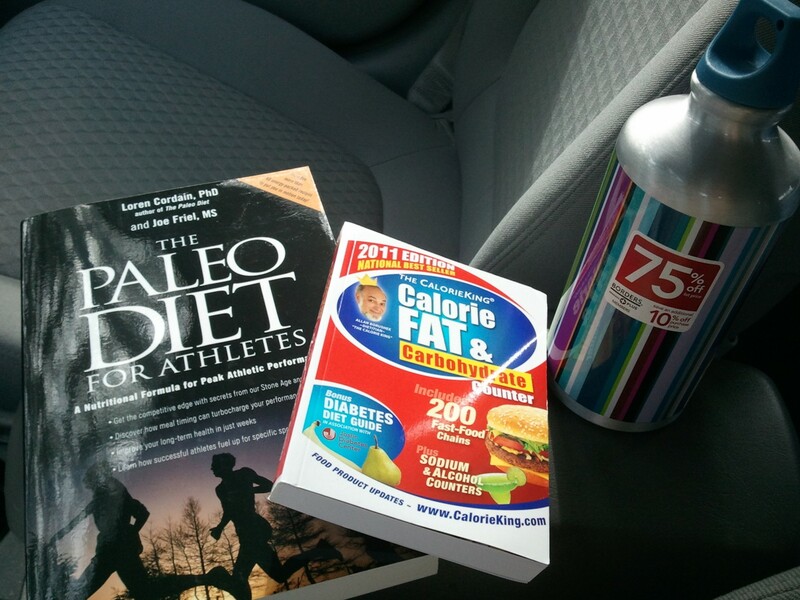 I also picked up the Calorie King updated book for carb counts and a new water bottle that was 75% off ($3!!). After my walk I went to look for low profile shoes elsewhere. 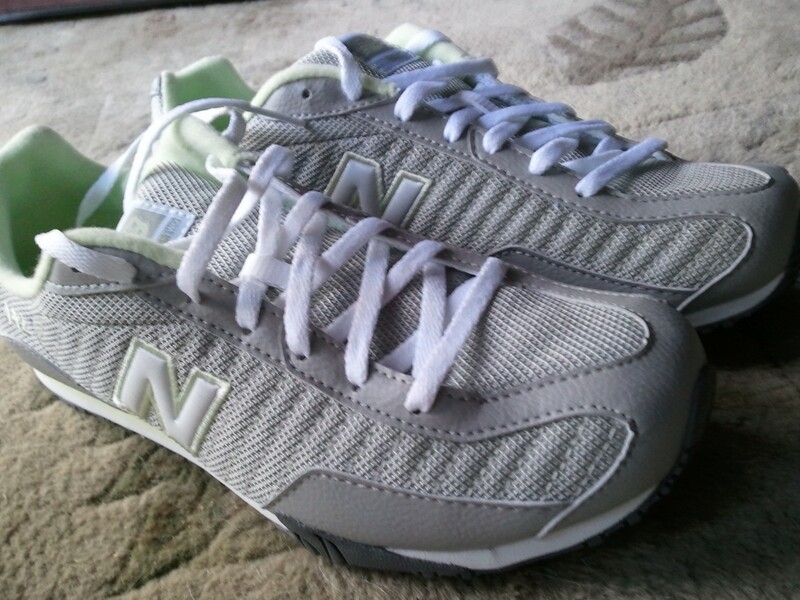 I didn’t have much luck but did find some decent New Balance shoes at DSW, so I picked them up. I probably should have gotten a 1/2 size larger, but my feet may just be a little swollen from today’s workout. We’ll see how they go. Plus…they’re rather cute! I went grocery shopping and bought all of my food on the perimeter of the store. That’s the first time I’ve ever done that! Woot!! Eating fresh and clean! I was also able to find some Nitrate/Nitrite free sausage. Score! Since today is 1/1/11, that means I need to start unloading some of my clutter. So….what’s the first item to be removed from the premises? That’s right….it’s not 1 but 3 things! 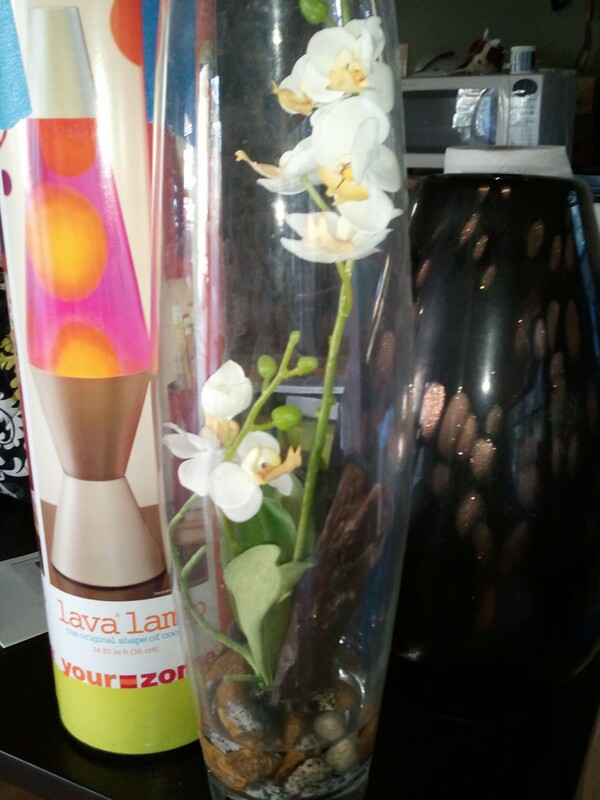 A Lava Lamp I got at Christmas (white elephant exchange), a leopard looking vase, and a vase with a fake orchid and rocks. They will be taken to work to see if anyone wants to vases…if not, they’ll be tossed. Woohoo!! 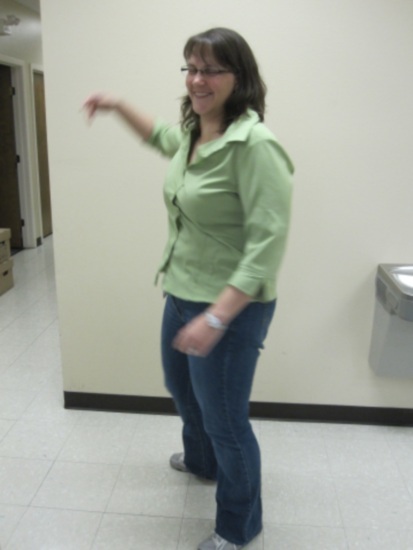 This entry was posted in Uncategorized and tagged De-clutter, JanGTD, Paleo, Race Training on January 1, 2011 by Tammy. I’m at the park getting ready for my first workout of 2011. Happy New Year! Ok, off the get my miles in. I hope you’re all enjoying this beautiful day! This entry was posted in Uncategorized on January 1, 2011 by Tammy.